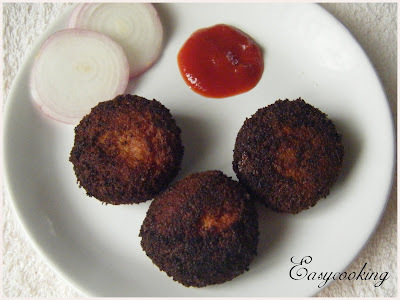 Easycooking: Vegetable Cutlet ~ The perfect snack!! Ever since I saw Ria’s post about Chicken Cutlets,I’ve been wanting to make the vegetarian version of it.I’ve never tried making a cutlet before so I was looking for a good,do-able recipe.My friends’ mom made great cutlets,both veg and non-veg.According to Ajay,her Beef cutlets are ‘to-die-for’;).I wasn’t sure how it would taste if I substituted the meat for mashed up veggies. Recently,while we were in Bangalore,I asked ma-in-law to give me a simple recipe for a cutlet since Ajay so vividly remembers eating up a couple of these as his evening snack during his school days.She smiled and said I was unnecessarily complicating the recipe.It,in fact is a very simple recipe which according to her even a 10 year old can whip up.Now that is a challenge for me,isn’t it? Though I planned to make it at the next given opportunity,I made it only yesterday.Ajay was doing some work and I wasn’t feeling so sleepy and hence was watching the Sunday movie on a Malayalam channel.I wished someone would make me a piping hot snack with a strong tea to wash it down with.But alas..no such luck.I had to make it myself..:).It tasted simply superb..crispy outside and soft inside..just too good.Ajay had 6 of them..no kidding!! In a pressure cooker,add all the vegetables and cook for 10-15 minutes or till the vegetables cook completely. Peel the vegetables and mash it well,keep it aside. In a kadai,add the oil and sauté onions till they turn light brown. Add the ginger-garlic paste,chilly powder and garam masala and sauté for 2-3 minutes on low flame. Add the mashed vegetables,salt to taste and mix well. Keep the flame on low and sauté till the mixture becomes dry. Transfer to another bowl and let it cool. Add ½ a cup of water to maida and make a thin paste. Powder the bread slices in a mixer to make bread crumbs. Make small balls of the vegetable mix and flatten it a little[shape it according to you preference]. Dip it first in the maida-water mix and then roll it in the bread crumbs. Add the cutlets to the hot oil and fry till they become dark brown on both sides. They look extremely crunchy...healthy one..
hi Divya. The cutlets look great, The crust looks crisp. Crispy cutlets looks beautiful Divya! Great to have it with a cuppa chai and a movie! Looks beautifully cooked. This cutlet looks yummy. My version is quite different though. Wow.. superb cutlets in perfect shape divya! Love it! I love cutlets,but not making often...you hav tempted me to make! luks yum divs..got to try..
Divs, cutlets look very crispy. I love cutlets tgh my fav is beef cutlet ;)Veg cutlets at BTH are my fav. looks crispy and nice..can imagine the yummy taste..just some hot tea to go with it..
Looks crispy ..awesome click !! It has been age I made cutlets at home! I like those! Looks so good. Nice recipe. Mouthwatering. Loved the crispy crust. YUM! jus love de recipe :) n do not deep fry if yur a calorie counter! :D instead fry t in a pan wit lil oil..! !